Already got a shingles vaccination? If you didn't get the new version, please do so, as it's way more effective. Since I got a new shingles vaccination myself this week, I thought you’d like to know what I learned, especially those of you who might be of a certain age. Basically, shingles is a second wave of chicken pox, and often occurs later in life. Or as one of the main definitions puts it, "Shingles is a viral infection that causes a painful rash. 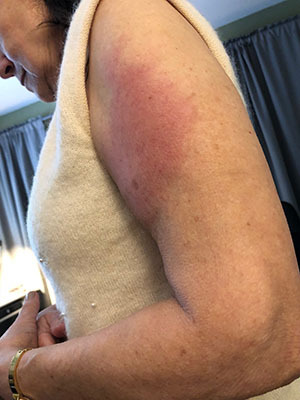 Although shingles can occur anywhere on your body, it most often appears as a single stripe of blisters that wraps around either the left or the right side of your torso. Shingles is caused by the varicella-zoster virus -- the same virus that causes chickenpox. After you've had chickenpox, the virus lies inactive in nerve tissue near your spinal cord and brain. Years later, the virus may reactivate as shingles. While it isn't a life-threatening condition, shingles can be very painful. Vaccines can help reduce the risk of shingles, while early treatment can help shorten a shingles infection and lessen the chance of complications." What I mostly learned, though, is that the shingles vaccination we used to get has been replaced by an improved one. Before, the most common shingles vaccination worked for about 50% of the people who took it, but now the improved vaccination called "Shingrix" should work for about 90% of the people who take it. Keep in mind, it takes two doses of this new one to be effective and it’s not the most pleasant shot you’ll get (left). But nowhere near as bad as shingles itself (right). Just look!